Nikon’s Black FX1000 have been engineered specifically for the precision shooter. 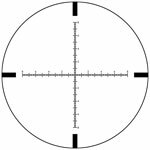 Available in magnification settings 4-16x and 6-24x, all of these riflescopes come standard with a first focal plane reticle. Reticles for these scopes have been etched into the glass and provide excellent detail and contrast at all magnifications. Black FX1000 riflescopes come with side focus parallax adjustment allowing for adjustments without leaving your shooting position. Elevated Turrets are engraved for enhanced visibility. Nitrogen Purged to prevent fogging from thermal shocks. Waterproof sealed prevents moisture from entering scope. 10 Levels of Illumination on models with Illuminated reticles. Return-To-Zero Stop is easily set up and retains zero until changed. Fully Muticoated Optical Glass provides excellent clarity, brightness, and contrast.